As an Immortal, there's two ways you can go about trying to be the last one. You can hermit yourself away in some remote place, practicing your swordplay continually, just in case anyone finds you, but hoping that they don't. Or, you just run around beheading anyone and everyone you come across, just in case. For Vasilek, The Knight, he's definitely opted for the latter of the two. 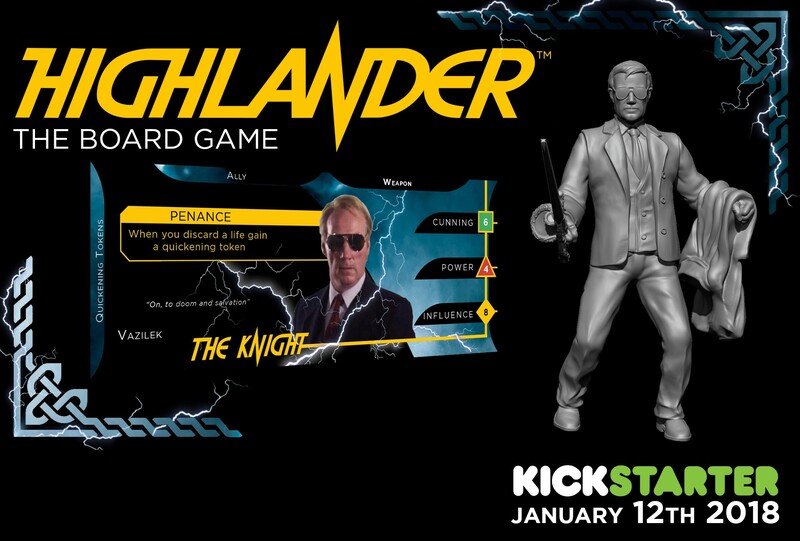 He'll be one of the characters you can choose in River Horse's upcoming The Highlander board game. Have a look at this preview. The third character available for play in Highlander, The Board Game is Vasilek, also known as Iman Fasil. In Fasil’s twisted worldview, he must be the one to win the Prize and fulfill his grand destiny. He slew many immortals over the centuries, taking part in some of history’s most notorious massacres simply to kill a single immortal living secretly amongst mortals. In 1535, Fasil fought against the Anabaptists in the German city of Münster during their brief and ill-fated rebellion. When the mad immortal, Jan Matthys, charged from Münster’s gates with only thirty men at his side, it was Fasil who fought and beheaded him. Fasil later travelled to Spain, where he studied under the great swordsmiths of King Charles V and forged his infamous Toledo Salamanca. The sword was a thing of beauty, with a gold plated hilt and pommel, ivory grip, and velvet ricasso detail inset with precious stones. Fasil was in Paris during the French Revolution and hastened many of the city’s nobles to the guillotine, believing a few of the city’s aristocrats to be immortals. Vasilek is always able to find the cards he needs in whichever deck he looks in, often allowing him to grab the life cards he needs at that moment, then using his ability to throw them away when he doesn't need them anymore. Vasilek is possibly the immortal that will change most during the game and may become powerful in each of the three stats as it suits him!